i found more than a wonderful, simple recipe when i discovered marcella hazan this month. i discovered a great story about a reluctant but gifted cook and teacher, and a feisty love story! it turns out that ms. hazan (now in her 80’s) didn’t care much about cooking until she married a man who cared about what he ate. she never learned to cook growing up in italy, though everyone around her cooked. she learned only when alone with mr. hazan in new york, forced to recreate the flavours vivid in her memories. and she discovered she had quite the skill for doing just that. with the encouragement of her husband, she went on to teach classes and write several cookbooks and is now credited with teaching americans about italian cooking. but marcella didn’t actually write her cookbooks. i read that it was mr. hazan who penned marcella’s cookbooks (entirely hers, but he translated them), and he has recently translated her memoir which i’m eager to read. there’s a in-depth interview with the two that i’m curious to watch too, to see more of this obviously extremely connected couple who, surprisingly, friends describe as at odds and bickering all the time. but back to that wonderful, simple recipe i found. it’s the one that’s been making it around the food blogs over the past few years, and it’s as simple as it is popular. i just saw it on smitten kitchen’s blog and judging by the 400+ comments on that post, i’m not the only one whose interest it peaked. it gets so much attention because it’s a unique unusual tomato sauce: butter, no oil? the fat isn’t used to…cook anything? i was intrigued enough to try it, plus it’s so easy: three ingredients and they all get thrown in together. so it became the centre of a lazy saturday lunch with my friends last weekend…and it was as luscious and satisfying as promised–a stick of butter will do that, i guess. one of my friends said the same thing that deb did in her post “it’s actually better without the cheese”. the simpler the better in this case. the recipe for this tomato sauce has been widely shared on the internet, so i feel i can share it here too. as with anything with so few ingredients, i recommend using the best. splurge on the san marzano tomatoes and a quality (long) pasta. and of course, don’t skimp on the butter. 1. combine the tomatoes, their juices, the butter, and the onion halves in a medium saucepan. 2. add a pinch or two of salt. place over medium heat and bring to a simmer. cook, uncovered, at a very slow but steady simmer, adjusting the heat as necessary, for about 45 minutes, or until droplets of fat float free from the tomato. 3. stir occasionally, mashing any large pieces of tomato with the back of a wooden spoon. taste and salt as needed. I’m astonished at the simplicity of this recipe, but at the same time, have learned in recent months that butter makes everything better. you will like it. and yes, butter is magic. After a lifetime of cooking and eating garlic and olive oil based tomato sauces, I gave this one a try, and it was a revelation! The recipe is now a regular in my cooking repertoire. I’ve actually had the good fortune to discuss the recipe with Marcella, and it is a favorite of hers too. She prepares it for herself and Victor almost weekly. what an opportunity that must have been! have you ever served this sauce to kids? i want to make it for my cousins little ones. 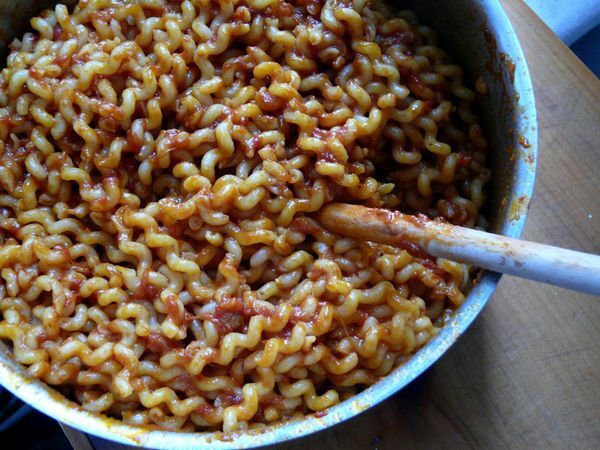 it seems perfect for kids: tomato sauce, noodles, sweetness of butter onions, no bite from garlic.